The extremely versatile emergency luminaires from LEDVANCE for almost all areas of safety lighting are now available at wholesalers. Simple planning and installation make the emergency luminaires attractive for installers in particular. This brings LEDVANCE yet another step closer to becoming a full-range provider, offering luminaires for a wide variety of applications with proven features and a good price/performance ratio. The emergency downlights from LEDVANCE cover the important safety lighting applications of escape route and anti-panic lighting. The round luminaires with built-in batteries and drivers are designed for three hours of operating time in the event of a power failure, and as escape route lighting provide a uniform, visible strip of light on the floor. They are characterized by their high luminous flux of up to 335 lumen and optimized light distribution, so that overall fewer luminaires are needed to produce the prescribed illuminance and homogeneity. The emergency downlights are designed for a wide variety of applications and are available in four different versions: for build-in or build-on installation, with a built-in test switch for manual testing or, alternatively, an automatic test equipment for self-tests. The emergency lights from LEDVANCE have been certified with IP43 type of protection and an IK07 shock resistance rating, and the company provides a three-year manufacturer's guarantee on the housing, electronics and LED light sources. The LEDVANCE emergency lighting range now also includes a compact safety sign with a robust and high-quality aluminum housing which is characterized by particularly homogeneous illumination and a detection range of 27 meters in accordance with DIN EN1838. It also complies with all the requirements of DIN 4844-1. Each luminaire comes with four different safety signs in accordance with ISO 7010 as well as a white, reflective foil for the back. During commissioning, the operating time in the event of a power failure can be set to either at least three or at least eight hours using a switch. The luminaire is designed for different applications and can be installed in a variety of ways. While installers can do entirely without accessories when mounting them on the ceiling, with appropriate accessories the luminaire can also be recessed in or hung from the ceiling, or mounted on the wall. The luminaire is equipped with both a built-in test switch for manual testing and automatic test equipment for self-tests. LEDVANCE offers its professional customers the option of upgrading many of its luminaires from its existing portfolio to safety lighting. 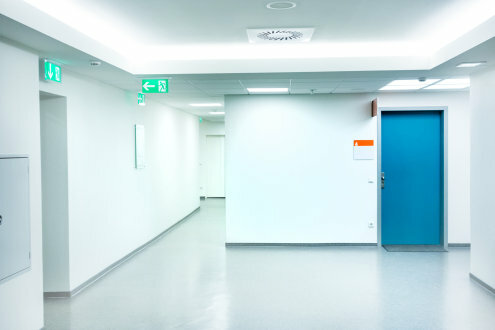 The conversion of LED panel lights, LED downlights and damp-proof luminaires to single-battery safety luminaires is made possible thanks to new emergency lighting components with an integrated emergency lighting driver and a lithium battery. The luminaires all come with automatic test equipment for self-tests and are designed for three hours of operating time in the event of a power failure. With offices in more than 50 countries and business activities in more than 140 countries, LEDVANCE is one of the world's leading general lighting providers for professional users and end consumers. Having emerged from the general lighting business of OSRAM GmbH, LEDVANCE offers a wide-ranging assortment of LED luminaires for a broad spectrum of application areas, intelligent lighting products for Smart Homes and Buildings, one of the largest LED lamps portfolios in the industry, and traditional light sources. In fiscal year 2017, LEDVANCE achieved a turnover of around 1.9 billion Euro. Based on an agreement with OSRAM, LEDVANCE will continue to use the trusted OSRAM brand for many of its products (SYLVANIA for the USA and Canada). Further information can be found at www.ledvance.com.